← A Month of the Leader! Another Bedrock Comics find. If you are in MA and find yourself in Framingham you should absolutely check this place out! 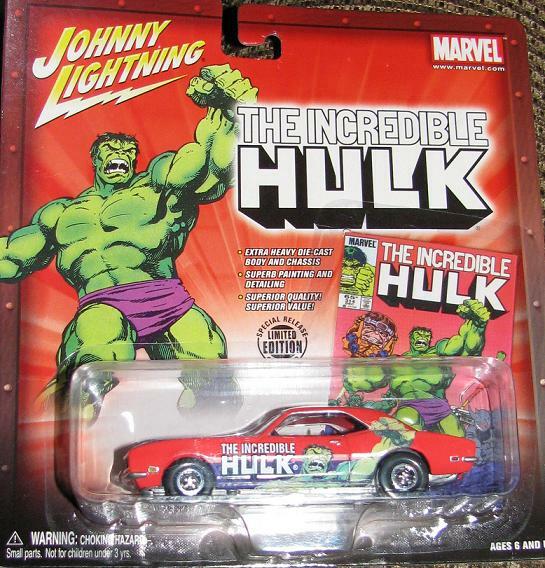 Anyways, this car is from the Johnny Lightning line and features the Hulk image from #314 – and even comes with a nifty collectible card! Woo Hoo! It looks a bit like the Dukes of Hazzard car… how great would that show have been if they actually had the Hulk painted on it rather than the confederate flag? Man, I could’ve seen the ratings shoot through the roof! This entry was posted in Hulk Cars, The Leader and tagged 2003, Leader. Bookmark the permalink. are you aware that the Dukes of Hazzard replaced Hulk on CBS after Hulk was cancelled? I was not… is that true?